Automatic darkening welding head shield suitable for welding and cutting up to 300 amps. Supplied with full instructions & spare front protective element. This helmet uses a high quality LCD coupled with a multilayer optical interference filter - this gives a clear view and provides permanent UV / IR protection to DIN 15. 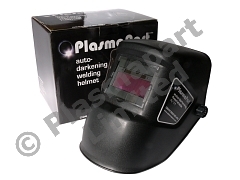 The helmet automatically darkens on sensing an arc strike, from an attenuation level of welding shade 4 to 11. This helmet is suitable for MMA, MIG / MAG and plasma cutting - it is not suitable for laser welding. The optical filter is powered by a combination of two solar cells and a built in lithium ion cell - it features Swiss optics and is replaceable. The helmet is produced from flame retardant Nylon and features an adjustable front-padded head strap. The helmet and filter are manufactured to EN 175 and are CE certified. This pack is supplied as shown, and contains one automatic helmet, replacement front protective element as well as full operating instructions.